Could an orange root vegetable hold the solution to heart attacks, stroke, dementia and cancer? The evidence says “yes” and read on for the proof. Turmeric is a root vegetable similar to ginger. 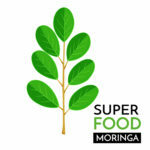 It is considered a spice in many cultures and used as a potent remedy for many health conditions since ancient times. This powerful herb has been cited in a number of studies for its ability to combat inflammation, arthritis, fatigue and pain. Read on for the incredible cardiovascular benefits of turmeric and its “secret” component, curcumin. Turmeric is a strong spice and a major component of curry powder. It is grown and used throughout India and other eastern countries. 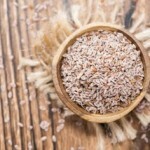 Historically, it’s been used widely in Ayurvedic and traditional Chinese medicine. Ready to BUY the best curcumin product? Click here for our Curcu Gold. This spice can help to eradicate common human pathogens such as Gram-positive Staphylococcus aureus and Gram-negative Escherichia coli, bacteria found in typical hospital settings, due to its ability to alter the integrity of bacterial membranes (Tyagi et al., 2015). This is important in today’s society as we continually see emerging resistant bacteria strains. Turmeric exhibits effective antibiotic potential (Tyagi et al., 2015). It has a high level of antioxidant activity that occurs through its action on free radicals and oxidative reactions such as lipid peroxidation (Ak et al., 2008). Lipid peroxidation is a deleterious process where fats in the body are damaged by harmful free radical molecules and when left unchecked can result in extensive cell damage and subsequent disease. Curcumin is a powerful antioxidant that has been found to inhibit this peroxidation (Ak et al., 2008). 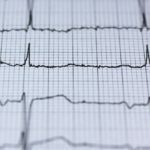 Chronic oxidative stress can lead to uncontrolled inflammation, which can ultimately play a role in the development of numerous chronic diseases such as CVD, cancer, diabetes and other neurological disorders (He et al. 2015). 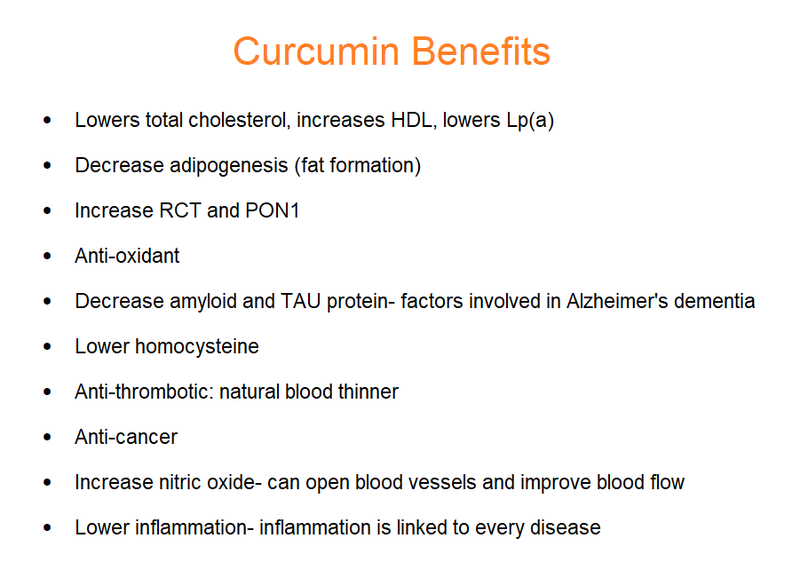 Curcumin has been demonstrated to have anti-inflammatory and anti-oxidative effects on several signaling pathways and biochemical targets related to disease development (He et al., 2015) revealing its high therapeutic potential. One of the targets of Curcumin’s anti-inflammatory action is inflammatory enzymes(or proteins) that are responsible for mediating inflammation in the body. Curcumin can inhibit these enzymes that instigate inflammation including cyclooxygenase-2, lipoxygenase, and inducible nitric oxide synthase (Menon et al., 2007). Inhibition of enzymes like cyclooxygenase can help to relieve inflammation and pain. This is the basic mechanism of how pharmaceuticals like aspirin work in the body. Studies have continuously revealed that Curcumin has been shown to inhibit the growth and proliferation of cancer cells as a result of its effects on multiple cell signaling proteins and pathways (Anand et al., 2008). 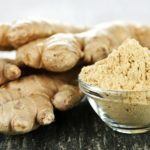 This spice has been found to reduce proliferation and survival while increasing apoptosis (programmed cell death) of cancer cells, elucidating its anti-cancer potential (Anand et al., 2008). Curcumin has also been shown to manipulate genes and inflammatory cytokines (or proteins) to turn them on or off causing effects on cell growth, survival and death, which can be a protective mechanism for preventing and treating cancer (Kunnumakkara et al., 2008). Studies have demonstrated that Curcumin can regulate blood glucose levels. In fact, it has been associated with lowering blood glucose levels while also increasing the PPAR- gamma pathway activation (Nishiyama et al., 2005). This pathway activation is associated with normalizing blood glucose levels. In fact, there are diabetic drugs that are specifically made to target PPAR-gamma pathways and activate them. Curcumin works naturally to increase this unique molecular target of Diabetes therapy to balance blood glucose levels (Nishiyama et al., 2005). Curcumin can help to treat arthritic symptoms such as joint pain (Daily et al., 2016). Inflammation is a known underlying mechanism of arthritic damage and studies have demonstrated the ability of Curcumin to help mitigate symptoms related to pain and inflammation (Daily et al., 2016). 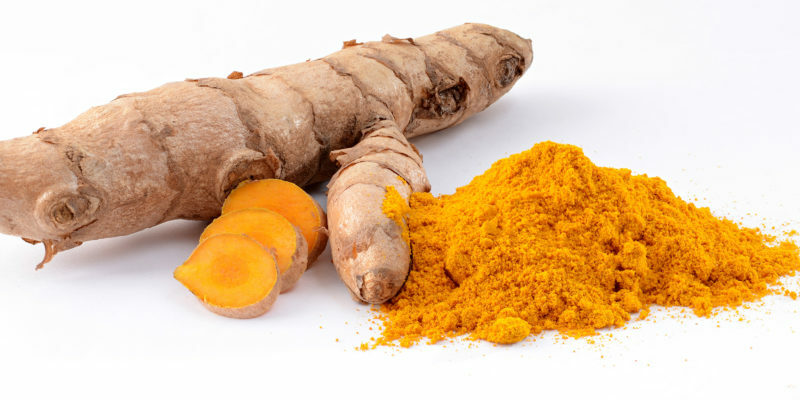 Studies have shown that Curcumin can down-regulate signaling pathways and proteins that can lead inflammation and pain, such as the NF-κB pathway, which is a therapeutic target in diseases like Osteoarthritis (Mobasheri et al., 2012). Research has revealed the anti-inflammatory and anti-thrombotic (anti-bloodclotting) effects of Curcumin are cardioprotective and may aid in ameliorating CVD pathologies (Wongcharoen et al., 2009). Inflammation and oxidative stress have been reported to be a prominent player in the development of CVD (Hanson et al., 2006). See picture below. One study analyzed the effects Curcumin on ischemia (obstruction of blood flow to the heart)- reperfusion injury (Liu et al., 2016). This injury occurs after the return of blood flow to the heart following the obstruction. When circulation is restored it can result in oxidative damage and extensive inflammation, which are detrimental. In this study, when Curcumin was administered in the event of ischemic-reperfusion injury, the rats were found to have lower levels of oxidative stress and the risk of heart failure/ death was reduced (Liu et al., 2016). It is thought to be protective in this event because it can activate the JAK2/STAT3 cell-signaling pathway and thus protect against oxidative damage (Liu et al., 2013). A recent review of the literature of Curcumin and skin health concluded that this spice should be used to treat a wide array of skin disorders as it can produce antibacterial and anti-inflammatory outcomes (Vaughn et al., 2016). Curcumin has been found to be protective of the skin because it can fight harmful free radicals and inflammation (Thangapazham et al., 2007). It was also found to aid in healing wounds faster (Thangapazham et al., 2007). Overall, Curcumin has profound effects in preventing the development of chronic pro-inflammatory diseases due to its ability to inhibit inflammatory pathways and cellular signaling molecules within the body! Check out our new supplement, Curcu Gold. This formulation is very potent and we are seeing some fantastic effects. Read more here. Ak et al., 2008: http://www.sciencedirect.com/science/article/pii/S0009279708002573?via%3Dihub#!